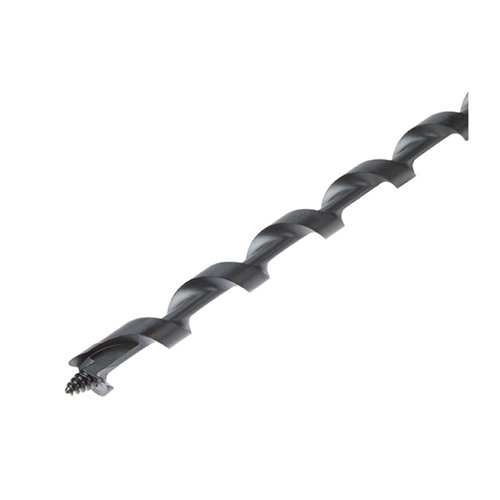 The SHOCKWAVE™ Lineman's Impact Auger Bits are engineered to deliver cleaner, faster holes in wooden utility poles. They feature a single spur design, which scores the edge of the hole, creating a cleaner finish that allows bolts to slide through without resistance. The bits are coated with a reinforced anti-friction PTFE coating for overall smoother drilling and easier removal of the bit from the pole. The aggressive feed screw and cutting edge pull the bit through the material while the optimized wide flute geometry quickly ejects the chips to clear the hole and reduce clogs, leading to overall faster drilling speeds. Milwaukee 13/16"x24" SHOCKWAVE Linemans Impact Auger Bit has a rating of 5 stars based on 1 review.